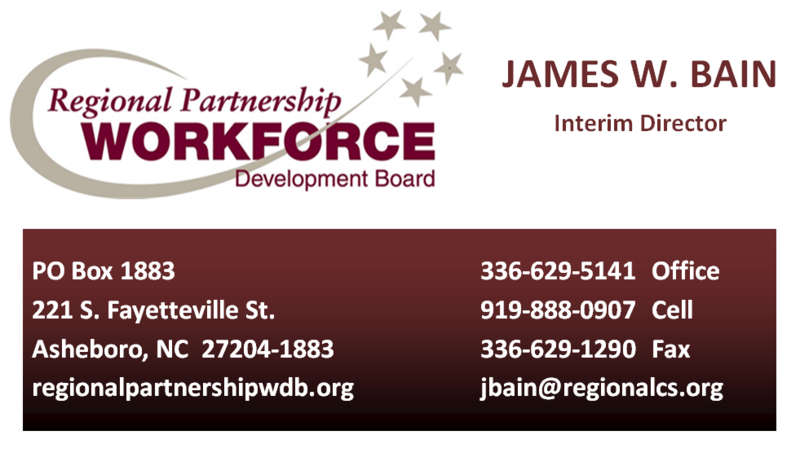 As one of twenty-three Workforce Development Boards located throughout North Carolina and a member of the NCAWDB (North Carolina Association of Workforce Development Boards), the Regional Partnership Workforce Development Board serves the counties of Alamance, Montgomery, Moore, Orange and Randolph. Through the Workforce Innovation and Opportunity Act (WIOA) we help individuals and businesses within this five county region gain access to the programs and services that connect talent to jobs. WIOA is designed to help job seekers access employment, education, training, and support services to succeed in the labor market and to match employers with the skilled workers they need to compete in the global economy. Regional Partnership Workforce Development Board consists of a group of community and business leaders appointed by local elected officials. Additionally we’re locally staffed by individuals with years of experience in our specific local and regional economy. Our five county service area is truly at the core of our state. Our region is supported by Interstates 85, 40 and 73 which provide one day trucking access to 60% of the U.S. population. There are also two international airports within an hour’s drive. We are home to a diverse economy of manufacturing, service, retail, transportation, tourism, healthcare and education. If you have questions or would like more information, please contact Director, James Bain, JBain@regionalcs.org. Boards have many responsibilities including oversight of the NCWorks Career Center for their area. The NCWorks Career Centers are the local offices where workforce development professionals from many agencies provide employment and training services. Board members also develop strategic plans for their regions, help identify quality training service providers, decide how to best implement the workforce development dollars available, and set policy and direction within the community. Board members are visionary – looking ahead at the needs and opportunities within the region is a requirement for being successful on a Workforce Development Board. Boards bring together a diverse group of people from the public and private sector that are committed to helping build the local economy and working as liaisons between job seekers and employers. Being on a WDB requires networking within the community, and continuing to create and maintain contacts with businesses and individuals.